According to Hubert Danso, CEO of Africa investor: “We are delighted to say that this year’s winners are our most exciting yet, and are testament to the ever-improving investment climate in Africa. 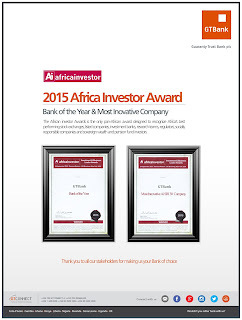 GTBank’s ability to continuously deliver notable success and significant progress across its businesses, despite increasing regulatory headwinds and an extremely challenging business environment has enabled it emerge double award winners in the 2015 Ai Institutional Investment and Capital Market Awards. Receiving the awards on behalf of the Bank, Segun Agbaje, Managing Director/CEO of GTBank said "We are humbled and proud to be recognized as the Bank of the Year and Most Innovative Company in 2015. For us, our emergence as double award winners is an acknowledgement of the hard work and dedication of our staff, management and Board. It represents our commitment to serving our customers and providing them with value oriented products and services suited to their varied needs. We remain resolute in our commitment to providing our customers with superior banking experience by prioritizing innovation, integrity and excellence in service delivery.